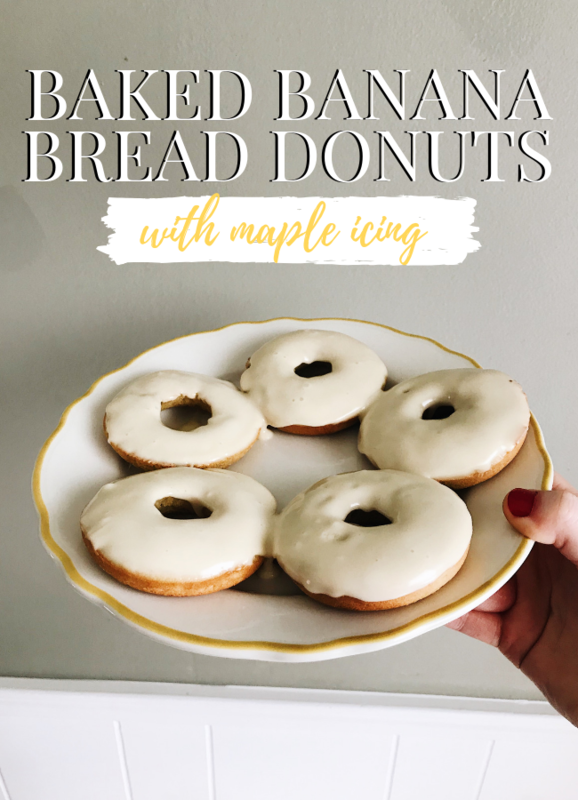 In early March I decided I wanted to try another baked donut recipe because I love donuts and wanted to test out a new recipe I had seen on Instagram! I have followed Elisabeth and Butter for months now, and all her recipes look soooo good. But these baked banana bread donuts are delicious and the first recipe of hers I actually tried, and I am sure it won’t be the last! Click here to see her post and her original recipe! Yields 18 donuts- I would recommend halving the recipe if it is just you and one or two other people. I ended up having to throw some away because my housemates and I couldn’t eat all 18 fast enough! 2/3 cup milk – I used 2% but Elisabeth’s original recipe calls for whole! Preheat oven to 350ºF and spray your donut pans with nonstick cooking spray. In a bowl, combine the flour and baking powder. In a mixing bowl fitted with a paddle attachment, combine the melted butter and sugar. Add the dry ingredients and eggs and mix together until just combined. Add the mashed bananas, vanilla and milk and stir until smooth, being careful not to overmix. Fill a large piping bag or ziplock bag with the batter, cut a small tip off the corner and fill until about 3/4 full. Bake donuts for 12-15 minutes or until they are set. Remove from oven, let sit in the pan for 5 minutes and then transfer to a drying rack to cool completely. In a bowl, combine the confectioners sugar and maple syrup until smooth. Add more maple syrup or milk if it is too thick. Dip each donut in the icing and let fully dry before eating or storing! Fairly simple and easy to make for a yummy Saturday morning breakfast! The banana bread donuts themselves are delicious, but the maple icing really compliments them well! If you want to see another donut recipe, checkout the blueberry ones I made last year. Do you ever make your own donuts? What is your favorite flavor of donut? Share in the comments below!